Dearie went to pick up his car in the afternoon and headed to RT in late afternoon ... and when I reached home I have to pack the stuffs that we bring up from the old car. And when TT is back I hand her the purple stuff toy hahaha straight away she put it down and say ugly I think she quite scare of it. After awhile she say wanna take photo with the purple stuff toys hahaha see her face still abit scare! After packing we bring down the stuffs and load into our new car .... hope this car give us a better luck! Office is closed today for repairing of the roof in our office hahah really happy an official off day! Headed to TT school for enrolling her in to next year school.... total cost is $390 for Jan and Dec school fees plus the school materials. She will be in 9am class next year wonder she can wake up on time anot. Teacher Rita told me that today she will be giving out the progress card. Went to pick up TT also and when I see her progress card I am happy cos she have improvement compare to the mid year. Hope she do well next time .... really scare now cos not easy. Next time for all studies matters I will leave to Ah Bok to do it .... I dun think I am up to it. Dearie have a meet up with his classmates so they asked me along cos I do know some of them cos we are in the same school. I make my own way to Bugis to meet them and we chosen to dine in MOF. Love the dessert makes me drool even way before I order my main dish.... TT also order a kids meal - Udon, sushi + a drink ...she so happy to see that! Had a great chat with all of them .... is really been long time since we see them. My baby was so excited when she knew that she will be attending YH birthday bash at Peek-a-boo. She woke up real early and kept asking when are we going..... Dearie came back from RT and need a rest so I asked TT to sleep with him after that then bring her over. She went to sleep with Dearie ... and she nap only for around 1.5h she woke up and asked again. We reached Peek-a-boo at 5pm sharp and when TT get into peek-a-boo ... I cant find her at all ... she is really fast in getting into the play area. Manage to get her and asked her to wish YH before going in to play again. 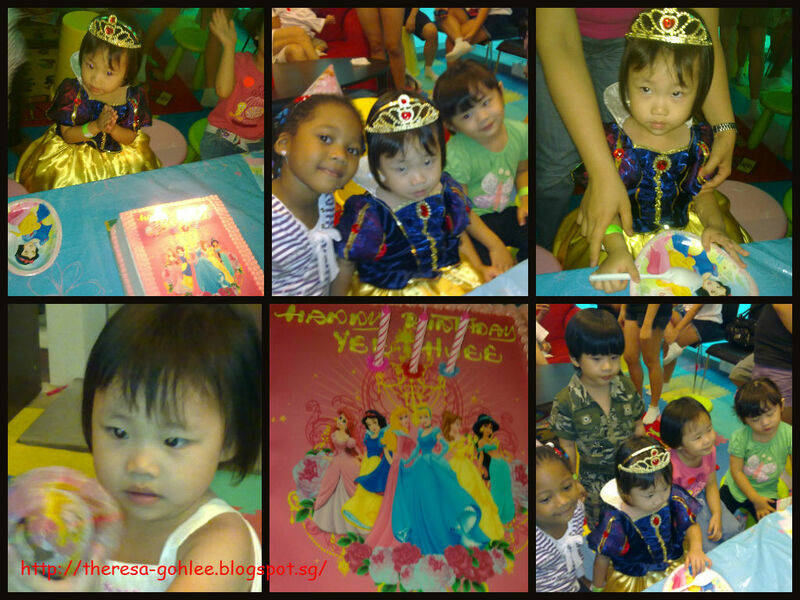 TT enjoyed herself very much ... so am I thanks Janice for inviting us! Today lesson in Tumbletots TT learn the letter V ....... so for the craft work she is suppose to paste the cut out van. She is always excited to spread the glue and also coloring. Went over to Tampines Mall to buy lunch for my 2 baobei and head off to watch Harry Potter with my gfs. I am a bit late but still manage to be in the cinema before the show start cos of my baby fell asleep and I have to help Dearie carrying her up before meeting Joey. Thanks to Weeli once again for booking tics thanks for coordinating it too! Harry Potter and the Deathly Hallows is the show we are catching ..... this time I feel that is nicer compare to the Half Blood Prince. First time I tear when watching Harry Potter cos of the death of an Elf - Dobby he was stabbed by Bellatrix's knife. Looking forward to the part 2 next year! 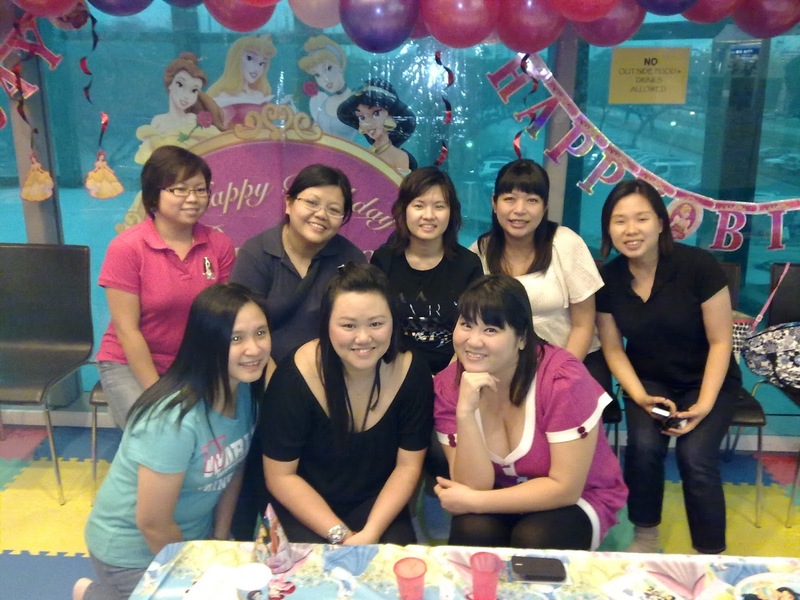 After we finished the show we headed to Bugis - Liang Seah Street to have steamboat buffet dinner. 鲜得来 is the place that we are going 1st floor is almost full and we are directed to 3rd floor ... lucky Weeli do the reservation cos in no time there is long Q. Dearie came with TT and he was so lucky to have his car park just in front of the shop. Their soup base is kinda fix ..... and they have salted duck soup haha something special.... the place is quite cozy but very small and I feel squeezy. Wanted to bring my girl to watch Hi5 since they will be having show at Marina Square so I apply 1/2 day leave when I am back in office today. Just so coincident I was asked to go for an interview at Lor Chuan area and thanks to Tracy for the recommendation. Dearie came to pick me and off we go to Lor Chuan. The interview went on quite well but they feel that I can't adapt. *sigh* In the sports industry for too long many dun wanna take us cos they feel we lost touch with the commercial industry. And they feel that I have a kid so is quite difficult as they work OT and during weekends too. To me I am fine as long the pay is good why not if I dun PIA now when then I can PIA. Took 1/2 day leave to accompany Dearie to view some cars that we have decided on. Initially Justin's Dad asked we to go over to Pasir Panjang to look at Honda Airwave. One of the model we are looking at. Unfortunately the car is being sold! So we change our route we go over to Ubi car mart to look see look see..... walk walk walk still go back to the dealer which we bought the Sunny from..... same sales person too ... we look at a few model Nissan Latio Premium, Honda Airwave and Toyota Altis. The sales man highly recommend Honda Airwave which I love too. Airwave demand is quite high so most of the dealer have only 1 or 2 and it will be selling very fast. I told Dearie about Honda Edix the only car that can have 3 seater in the front seat... TT was so excited about the car when we try to sit in ..... cos she feel that she can sit with the 2 of us in front and she kept pointing to us about the car. Tried Honda Freed as well ... the only 1.5 7 seater car ..... dun really like it cos I feel very squeezy in it so that is out! We decide to have Honda Airwave and the Dealer actually wanted to take in our Nissan at only 22K and they way he say will help us fight for more makes me feel sian cos I believe they can give more than that. So we decided to go around again ...... cos is pouring heavily! Went over to level 2 and there is one Airwave we are looking at .... the Sales Man approached us ..... and show us the car. He was very friendly and he gave us a good price to take in our Nissan at $23K. And the condition of the car is way better than the one we saw earlier ... with leather seats too. And we deal it! Very fast hor .... hmmm cos we feeling very tired looking around .... hope this car will give us good luck! Dearie called me at around 9+am in the morning and when he talk I dun really get what he mean. I only manage to hear that he 撞车! After I asked him again then he speak more clearly guess he was still in shocked! He told me his car is being hit and run ... he was turning right into a lane which lead to a carpark just outside STE and a vehicle just came straight to his right side hit and run ..... this Driver suppose to cut his left side not right side as my Dearie will not fail to on his signal when turning! Curse that stupid driver very irresponsible of you not to stop the car what comes around goes around! After the incident we doing some calculation on the damage that we need to fork out cos we dun intend to claim insurance the premium will be high next time. At the same time Dearie and HY become "detective" going around the buildings at their work place asking for CCTV records see if any capture the accident. And also to wait see if traffic police have any news of it but we just feel chances are very slim! After discussion with with our family we decided to change the car! And we did some "homework" going through the sgcarmart webbie check out and list out the cars that we are interested in. 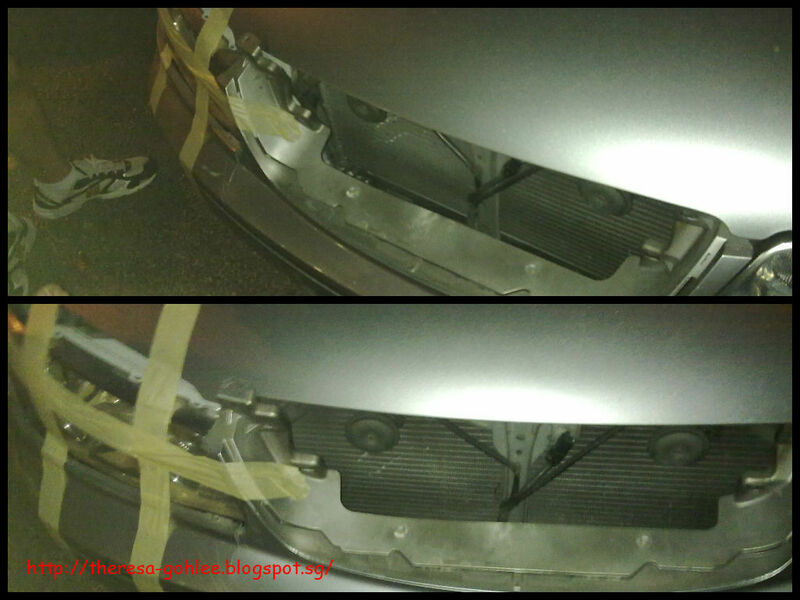 Hope to change it cos this car is the 2nd time having accident and we just find it unlucky! 希望大, 失望越大.... menses come liao = have to try again .... I am kinda regret for not starting soon of our number 2 plan .....but first we are very tired taking care of TT,second we never work, third partly my thyroid is not very stable. On Friday, I am off work early and went back waiting for my helper to come over before fetching TT. Dearie called me and tell me he might need to work OT so I have to do fetch her on my own. I took my own sweet time to go over Bedok and even went a little shopping at the Pasa Malam .... bought one tights for TT hope she like it. While walking over to my in law shop ... Dearie called and say that he is able to fetch us cos he is leaving office. After fetching us we headed to Vegan Burg for dinner ... wanted to try this weeks ago but we are kinda busy so never get a chance. Is about 9+pm so the place is not as packed as we see weeks ago. Dearie had their Pepper Mayo while I order the Tangy Tartar ... as for TT we ordered Vegan Franks for her .... she say is yummy! The portion is real big .... I can't finish and packed back the rest of it total is $23.50 is about having a Carl Junior meal :) Try it if you are near Eunos! Addy: 44 Jalan Eunos. We are invited to Arthur's birthday dinner at Paradise Inn at East Point so after our monthly CC meeting we headed over. We are all very full after the sumptuous meal love the soup is really nice! Went back to Bedok to have cake cutting with Arthur somehow I feel I am lousy at buying gifts nowadays. I bought popular vouchers for Arthur so that he can buy something he like over there. TT bought towels for him hahah so cute to see kids giving gifts to each other! Almost everyday when my dear dottie wake up she will asked me "mummy, is it going Tumble Tots?" So I have to tell her we only go there on every Saturday.... haha she is really getting excited going there. Today she put on the T-Shirt and feeling very happy! Today she get to see more friends .... some of them have siblings to go in with them. 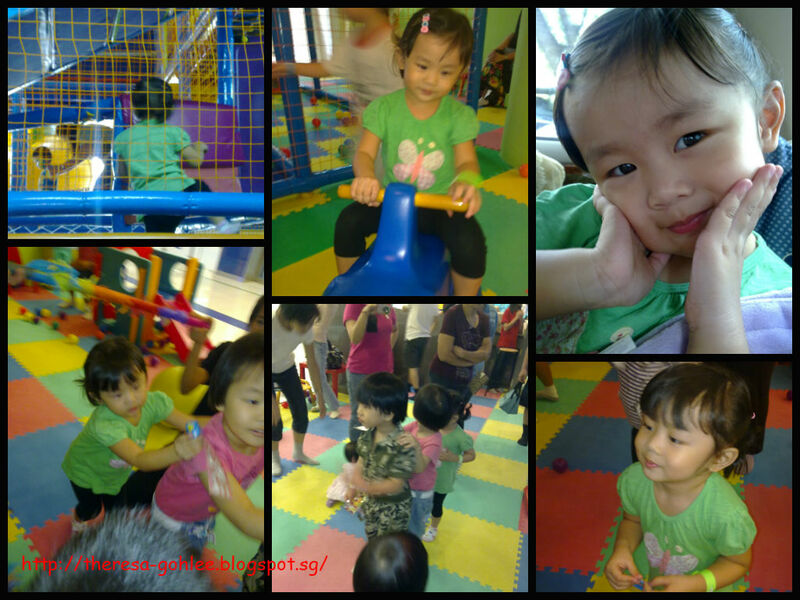 She just love the physical play especially SLIDES! Can see she really enjoyed the phonics session ... glad that she is doing well too .... we should be continuing with them after the 4 lessons. Before we start to shop ..... I went to the main thing I wanna do - that is to buy some assessment book for TT to do over the school holidays in Dec. Her last day of school is on the 3rd of Dec. Call me a KIASU parent .... I dun denied I am really KIASU haha ..... I want her to start to learn how to write! We chose about 5 assessment book and after discount it cost us only $17.08. After buying her assessment at popular we went back to parkway to get other stuffs and I was 1st in the Q at 3.15pm for the 4pm meet & greet session! I am so excited to see them ... TT is rather tired so she didnt really smile alot. Anyway I am very Happy cos when we are in Japan Disneyland we only get to see them during Parade time. After the Meet & Greet we headed home to rest and at 7pm we went down to attend RC Deepavali celebration. And Frances & I went on stage to play some games ... nice night but is a bit warm I was sweating alot! We also got a lucky draw prize is a cafe latte glass very nice! My dear nephew - Alfred got 3rd position in his class he was very excited after his result is out he is counting his marks see if he could get 1 in class cos SIL GLC promise him if he get number 1 she will bring him to Japan! He is a bit disappointed but you have done well Alfred keep it up! Today is last day of school will be holiday meaning our trip to Genting is drawing real near! I am still thinking what should I bring for TT looks like lotsa things need to bring along. Looking forward to it!